Are You Ready For Dark Knight Voltron? It had to happen: Voltron is getting a live-action big-budget remake, courtesy of the producers who brought you Get Smart, Wanted and The Dark Knight — with a focus on being Transformers, but with added human spirit. Be very afraid. Hollywood Reporter's Risky Business blog reports that the live action reboot of the popular Japanese cartoon that was being worked on by 20th Century Fox — which had a completed script, courtesy of Justin Marks — is no more, thanks to rights reversion. [U]nlike other robotic action movies, 'Voltron' is the personification of the human spirit, a quality that will set this movie apart. Wait, "personification of the human spirit"? 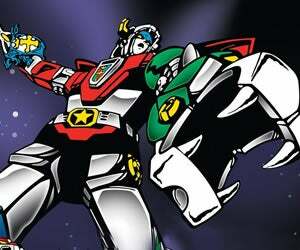 This is the same Voltron that's a giant robot made up of other robots, right...? No studio has been announced as being involved with this project yet.